The atrioventricular node and bundle of His are normally the only communication between the atria and the ventricles. The atrial impulse must pass through the atrioventricular node, which delays the impulse due to its slow conduction, before the impulse may reach the ventricles. The physiological advantages of this configuration has been discussed in Chapter 1. Some individuals, however, possess an additional pathway between the atria and the ventricles. Such pathways may be conductive, such that they can transmit the atrial impulse to the ventricles directly. These pathways are termed accessory pathways (or bundle of Kent). They are remnants of the embryological development of the heart. Accessory pathways (Kent’s bundle) may be able to conduct the impulse from the atria to the ventricles (antegrade direction), from the ventricles to the atrial (retrograde direction) or both. Short PR interval: The PR interval is <0.12 seconds. Delta wave: depolarization of ventricular myocardium will start where the accessory pathway inserts into the ventricle, and the impulse will spread slowly because it will propagate outside of the conduction system. This is reflected on the ECG as a slow start of the QRS complex and this part of the QRS complex is referred to as a delta wave. 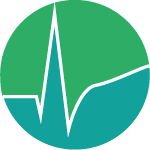 QRS duration ≥0.12 s: Because the delta wave is included in the QRS duration, the total QRS duration will be prolonged. Individuals with accessory pathways (Kent’s bundle) only display pre-excitation on the ECG when impulses are actually conducted over the accessory pathway. In most individuals with accessory pathways the conduction over the pathway is intermittent, meaning that pre-excitation may not be seen at all times. 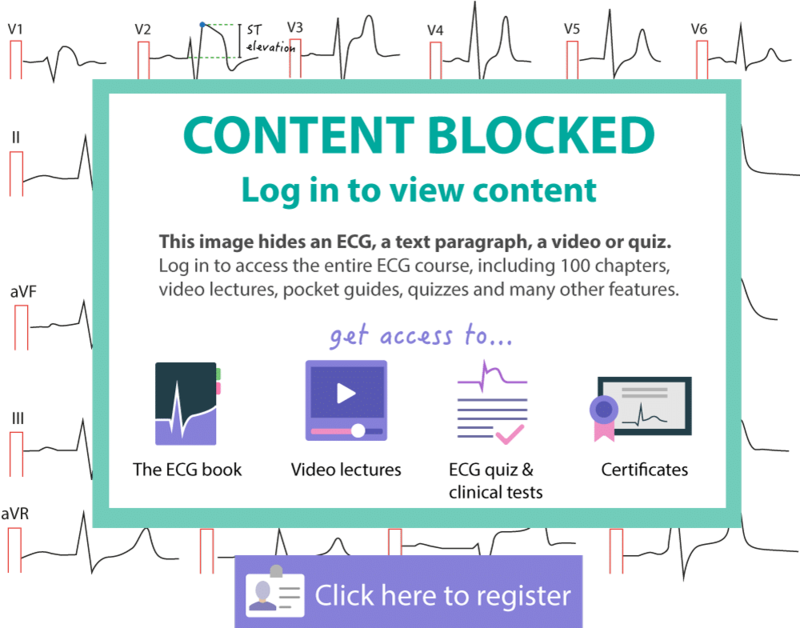 Figure 1 presents ECG findings during normal atrioventricular impulse transmission as well as ECG findings during pre-excitation. Figure 1. Hallmarks of pre-excitation on the ECG. As mentioned in Chapter 1, pre-excitation causes secondary ST-T changes. This is due to the fact that pre-excitation leads to abnormal depolarization of the ventricles and this leads to abnormal repolarization as well. The ST-T segment is directed oppositely to the delta wave, meaning that a positive delta wave will be followed by a negative ST-T segment (typically with ST-segment depression and T-wave inversion). ECG in Figure 2 exemplifies how delta waves are associated with secondary ST-T changes. Figure 2. Pre-excitation in a 25 year old woman. There are numerous leads showing ST-segment depression and T-wave inversion. There is very short PR interval, wide QRS complexes and delta waves in numerous leads. Can you spot them? Note that negative delta waves may simulate pathological Q-waves (and thus be confused with previous myocardial infarction). Individuals with accessory pathways are at risk of developing atrioventricular reentrant tachycardia (AVRT). This is a rapid tachyarrhythmia in which a macroscopic re-entry circuit which involves the atria, atrioventricular node, accessory pathway and the ventricles. In most cases the re-entry is induced by a premature atrial beat. Atrioventricular reentrant tachycardia (AVRT) occurs in two types: orthodromic and antidromic (illustrated in Figure 3). In orthodromic AVRT the re-entry impulse circulates in antegrade direction through the atrioventricular node. In antidromic AVRT the impulse travels in retrograde direction through the atrioventricular node. Figure 3. Antidromic and orthodromic AVRT. An individual with evidence of pre-excitation on resting ECG who also has recurring tachyarrhythmias is said to have Wolff-Parkinson-White syndrome. This is actually a rather common condition and some studies suggest that the prevalence is 1–2 in 1000 in the population. Wolff-Parkinson-White syndrome is more common in men. Pre-excitation can only occur if the accessory pathway is capable of antegrade conduction. If the accessory pathway is capable of conducting the impulse in both directions (atria to ventricles as well as ventricles to atria) the individual will display pre-excitation during sinus rhythm and also be at risk of antidromic and orthodromic AVRT. If the accessory pathway is only capable of conducting from the atria to the ventricles, there will be pre-excitation during sinus rhythm and a risk of developing antodromic AVRT. In one third of all cases, the accessory pathway is only capable of conducting from the ventricles to the atria. In these cases there can not be pre-excitation, but there is a risk of antidromic AVRT. This condition is referred to as concealed WPW syndrome (because the delta wave is not visible). Figure 3 displayed the characteristics of orthodromic and antidromic AVRT. The 12-lead ECG is useful to determine the location of the accessory pathway. This is done by assessing which leads that display the delta wave as well as the direction of the delta wave (negative vs positive). We recommend the use of the following algorithm (Figure 4) to determine the location of the accessory pathway in pre-excitation (Fox et al: How to identify the location of an accessory pathway by the 12-lead ECG; Heart Rhythm 2008). Short PR interval (<0,12 s). Delta wave and prolonged QRS duration (≥0,12 s). Typically secondary ST-T changes with the ST-T-segment being directed opposite to the delta wave. Figure 5 (below) shows an example of pre-excitation during sinus rhythm. Figure 5. ECG showing pre-excitation (delta wave) during sinus rhythm. Orthodromic AVRT means that the ventricles are depolarized normally via the atrioventricular node and His-Purkinje system (Figure 3). Because the impulse reaches the ventricles through the His-Purkinje network the QRS complexes will appear normal (i.e QRS duration will be <0.12 s). Orthodromic AVRT represent approximately 95% of all cases of AVRT and it arises when a premature atrial beat encounters a refractory accessory pathway but excitable atrioventricular node. 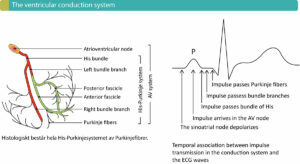 The impulse will then propagate normally through the His-Purkinje system, depolarize the ventricles and circulate back to the atria via the accessory pathway. A ventricular premature beat may induce orthodromic AVRT by the same principles. Normal QRS complexes (QRS duration <012 s). Regular ventricular rate 150-250 beats per minute. P-wave is visible in most cases. It is retrograde in leads II, III and aVF and it occurs after the QRS complex (somewhere on the ST segment or early on the T-wave). The retrograde P-wave may simulate an ST-segment depression when it occurs early on the ST-segment. RP interval (discussed in this article) is short but typically longer than 70 ms. RP interval may, however, be long if the accessory pathway is slow. Orthodromic AVRT may be difficult to discern from AVNRT and it is often necessary to perform an invasive examination. The re-entry impulse travels in retrograde direction through the atrioventricular node in antidromic AVRT. This variant arises when a premature atrial impulse is discharged near the atrioventricular node when it is refractory. 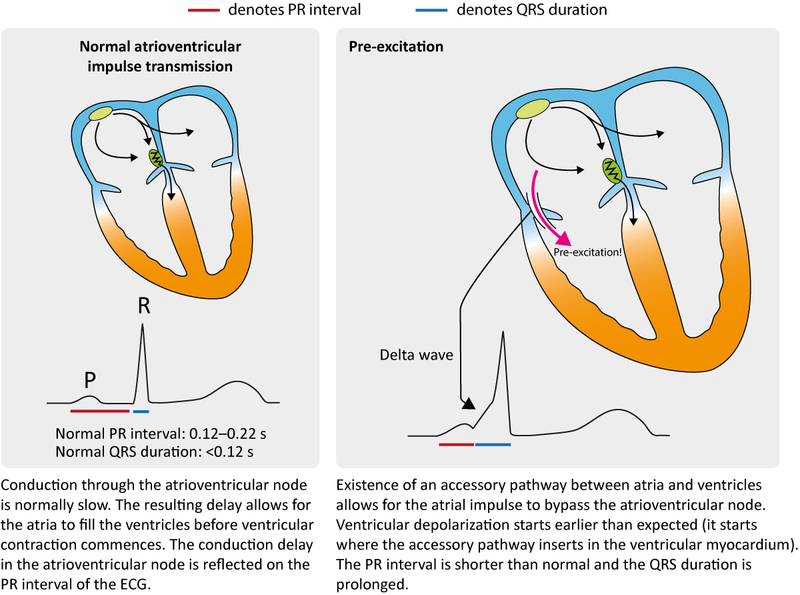 The premature atrial impulse will then travel from the atria to the ventricles via the accessory pathway and subsequently back to the atria via the atrioventricular node. 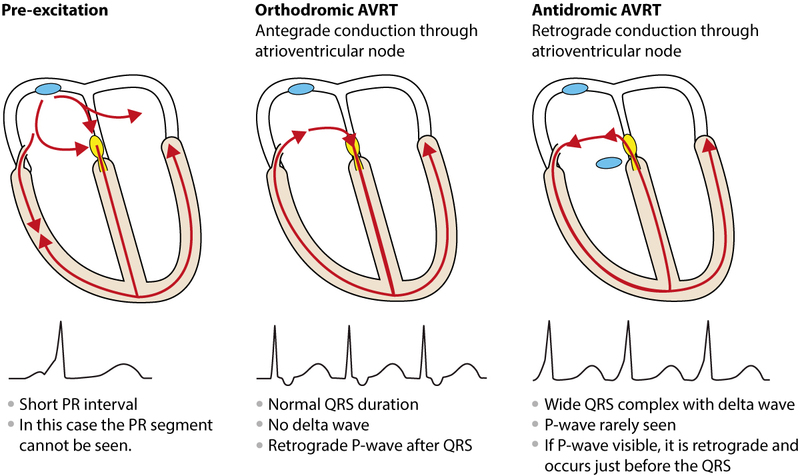 Antidromic AVRT yields wide QRS complexes and delta waves. However, the delta waves may be difficult to discern and it is often difficult (sometimes impossible) to differentiate antidromic AVRT from ventricular tachycardia. Antidromic AVRT represents 5% of all cases of AVRT. It may reach very high heart rates and cause hemodynamic compromise. Wide QRS complexes (≥0.12 s). The delta wave is visible in most cases. Regular ventricular rate 150–250 beats per minute. P-wave is generally not visible, but if it is, it is retrograde and occurs before the QRS complex (i.e the RP interval is long). It is very useful to examine the first QRS complexes that follow termination of an arrhythmia suspected to be antidromiv AVRT; the chance of spotting delta waves is maximal on the first QRS complexes following termination of the arrhythmia. 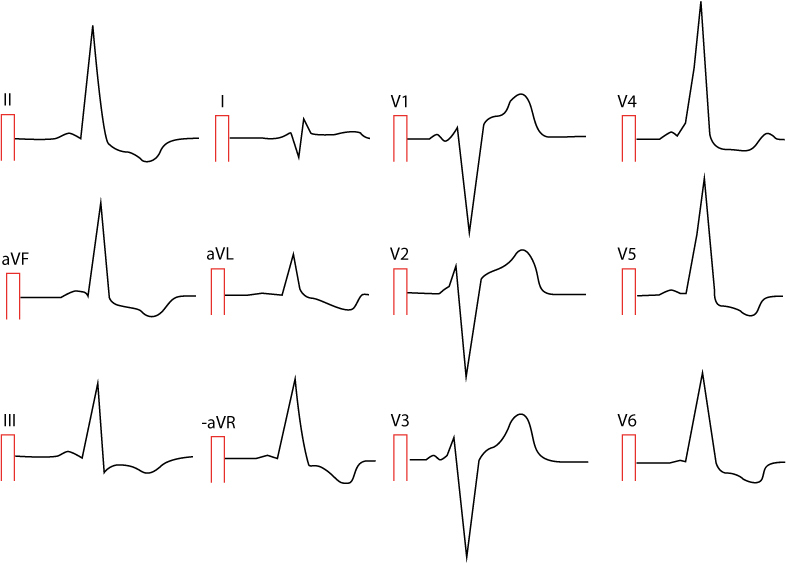 Conduction from atria to ventricles via an accessory pathway during atrial fibrillation causes an irregular tachycardia with wide QRS complexes. This is worrying because the accessory pathway does not exhibit the physiological impulse delay that characterize the atrioventricular node. Hence, the conduction through the accessory pathway may be very rapid and the ensuing ventricular rate may cause hemodynamic compromise. It is absolutely contraindicated to administer adenosine (or other agents blocking conduction through the atrioventricular node) to patients with irregular wide QRS complex tachycardias, because the arrhythmia may be a pre-excited atrial fibrillation. Blocking of conduction through the atrioventricular node may lead to accelerated impulse transmission through the accessory pathway, whereby an atrial fibrillation may cause ventricular fibrillation and cardiac arrest. The majority of all patients with pre-excitation will experience AVRT. The arrhythmia causes typical tachycardia symptoms (palpitations, dyspnea, anxiety, chest discomfort) but may also reduce cardiac output to the point of syncope or heart failure. Life-threatening cardiac arrhythmias are unusual, with the exception of pre-excited atrial fibrillation administered adenosine. Atrial fibrillation is very common among people with pre-excitation. Up to 30% may develop atrial fibrillation. Some individuals with pre-excitation display multiple accessory pathways, which increase the risk of of atrial fibrillation and complicates treatment. Occasionally the function in the accessory pathway ceases spontaneously and the risk of pre-excitation and arrhythmias is elminiated. Orthodromic AVRT is treated the same way as AVNRT. Adenosine is generally safe and very effective in terms of terminating ortohdromic AVRT. Note that administration of adenosine may induce atrial fibrillation and this may aggravate the arrhythmia. For the same reason agents that block atrioventricular transmission (beta-blockers, diltiazem, verapamil) should not be administered in patients with pre-excitation and concomitant atrial fibrillation, atrial flutter or atrial tachycardia. Procainamide is a better choice. If pharmacological therapy fails or the patient is hemodynamically affected, electrical cardioversion is warranted. Pre-excited atrial fibrillation/flutter: Electrical cardioversion is always the primary choice in pre-excited atrial fibrillation. Agents blocking transmission in the atrioventricular node (Adenosine, beta-blockers, calcium channel blockers, digoxin) is strictly contraindicated for reasons explained above. Pharmacological agents that may be tried are amiodarone, flekainid, propafenon, procainamide and sotalol. Experience suggest that procainamide is the best alternative. If the duration of arrhythmia is <48 hours, there is a significant probability that the arrhythmia will self-terminate and covert to sinus rhythm. If the duration of the arrhythmia is >48 hours the patient must be anticoagulated (as conventional in atrial fibrillation) before electrical cardioversion. 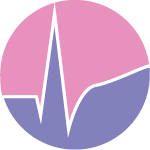 It can be recommended that calcium channel blockers and digoxin not be used in patients with pre-excitation because of the risk of atrial fibrillation in this population. Patients with asymptomatic pre-excitation during sinus rhythm do not necessitate any treatment (although a discussion with a cardiologist may be warranted). Patients with WPW syndrome (i.e pre-excitation with episodes of tachyarrhythmias) should be referred for ablation. The vast majority of patients will be cured by ablation therapy. If medications are needed as a bridge to ablation, beta-blockers should be preferred. LGL (Lown-Ganong-Levine) syndrome has traditionally been described as pre-excitation with an accessory pathway between the atria and His bundle (with antegrade conduction). This is considered to result in tachyarrhythmias with short PR interval but no delta wave and normal QRS complexes. However, there are no evidence that such a syndrome actually exist and electrophysiological studies have consistently failed to verify the existence of such an accessory pathway in patients presenting with such arrhythmias. Therefore, the term LGL syndrome should not be used. Mahaim fibers are accessory pathways between the atria or the atrioventricular node and the bundle branches (left or right bundle branch). In most cases the accessory pathway is connected to the right bundle branch which results in tachycardia with left bundle branch morphology on the ECG. PJRT (Permanent Junctional Reciprocating tachycardia) is an incessant tachyarrythmia caused by an accessory pathway. The RP interval is long and the accessory pathway is typically located posterolaterally and has slow retrograde conduction.